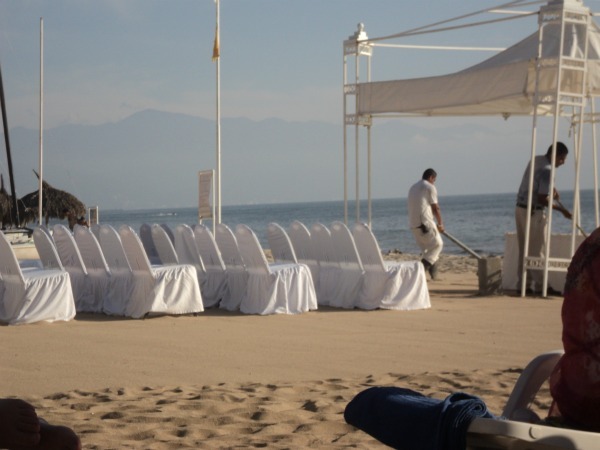 It is easy to plan a beautiful beach wedding in Puerto Vallarta. Wedding accommodations are available at every resort and of course, there are miles of beaches in the area for private ceremonies. You might need to take a trip before the wedding to check out all the resorts and find your perfect beach wedding location. There are plenty to choose from so look at as many as you can. One of the best things about Puerto Vallarta is that it offers reasonably priced wedding packages to suit your needs. The staff for your Puerto Vallarta wedding will work endlessly to make sure that everything is absolutely perfect for your special day. Paying attention to the minutest detail, they will even actually rake the sand until there is not a mark in it! Now if you want to be whisked off to one of those fancy private beach locations for your ceremony then all your guests will be taken there by boat prior to your arrival. Wedding attire can be as formal or as casual as you would like. Lace wedding gowns are in this year. Dresses come in a wide variety of styles to choose from that can help flatter your figure. Destination wedding dresses for the bride and traditional Mexican wedding shirts for the groom are also good choices. Looking for some other Beach Wedding Ideas? I can still remember the first time I saw a real life beach wedding in Puerto Vallarta. So here I was just minding my own business, tanning on the beach and off in the distance, I spotted a lovely wedding ceremony taking place with hundreds of onlookers. When the bride and groom kissed, everybody on the beach applauded and many tears were shed. Everything was so beautiful and romantic, just like out of a fairy tale. I literally thought I was dreaming. Finally, do not forget about your Puerto Vallarta Honeymoon. Take this into consideration when you start planning your beach wedding in Puerto Vallarta. We would love to hear about your special Beach Wedding Day. Please share your story and photos with us.